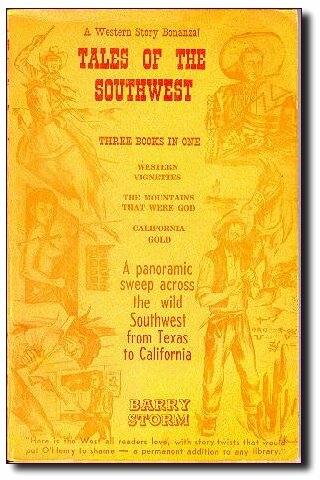 Tales of the Southwest... 1958. From the back endpaper: "A Western story bonanza! ... A vivid centuries-long parade of savage Indians, daring miners, wild cowboys, gunfighting sheriffs, raiding outlaws, frontier people and hot-blooded women in a flamboyant collection of Western short stories, novelettes, short works and illustrated factual lore -- all struggling against wild Western environments, the irony of fate, and themselves -- a panoramic sweep across the wild Southwest form Texas to California!" 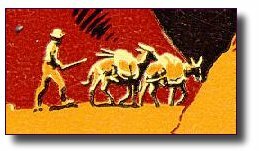 CM: "Stories based on fact about Indians, lawmen, miners, outlaws, and cowboys. Treasure and mining information." Book I (pages 9-89) is Western Vignettes. It contains these short stories, five of which were previously published: Hideout, Dead or Alive, Of Men and Heros, "All's Fair" for fair Eleena, Ore, "Like Father, Like Son," and Honeymoon Roundup. Book II (pages 91-156) is The Mountains That Were God, "adapted from the factual book Thunder God's Gold copyright 1945, 1946, 1953 by Barry Storm." Storm is supposed to have sold copies of Book II, The Mountains That Were God, as a separate work, but I have never seen one. The 1967 version of Thunder Gods' Gold: The Mountains That Were God is not this separate publication, though it does follow this text closely with the exception of different first chapters. There are some significant differences between this version of the Thunder God's Gold text and the 1953 edition. Book II, The Mountains That Were God does follow very closely the 1953 text, Part I, Western Treasureland and Part II, Bonanza History, but omitted are Part II, chapters 6, 10, 12-14, the Prologue to Part II, and two pages of text in the Mountain Treasures chapter. Other differences: Storm inserted a new paragraph in the In Treasureland chapter, most of the photographs make the transition, and there is a greatly expanded No Credit section on the Lust for Gold episode, making use of the 1954 work I Was Swindled By Red Movie Makers. Book III (157-225) is California Gold, "from the screenplay 'Lover's Gold,' copyright 1954 by Barry Storm; readapted from a fictional portion of a 1949 Columbia Pictures Corp. public domain, libelous screenplay, 'Lust For Gold,' based upon a fictionalization of factual incident from 'Thunder God's Gold,' unauthorized by the author, Barry Storm." crumble away their dreams abide. endures. And love's sweet song enchants a thousand summers. strumming the cosmic heartstrings of eternity. And then there is the dedication: "For Western People Everywhere Whose Creative Minds Remain Untainted By Socialistic Bureaucracy And Whose Own Sinews Hew The Earth Into Free Enterprise Created Of Themselves."